It’s been a sweltering 100 degrees here in NJ and I’m hot, sweaty and tired and just want to jump in a pile of crunchy leaves while sipping spiked apple cider. 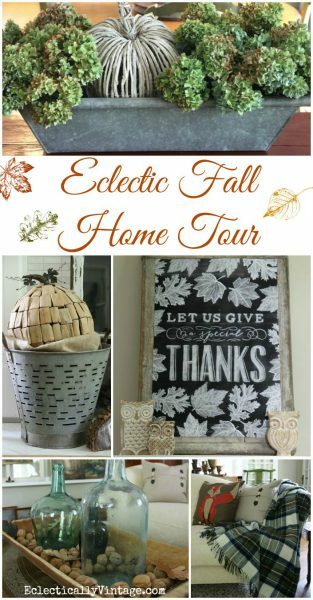 I’ve got fall on my mind so I’ve been scouring my posts (don’t miss my home fall tour from last year for tons more ideas) from the last five years and noticed a common thread – I like using things from nature (read: cheap or free)! or a vintage chip tin. 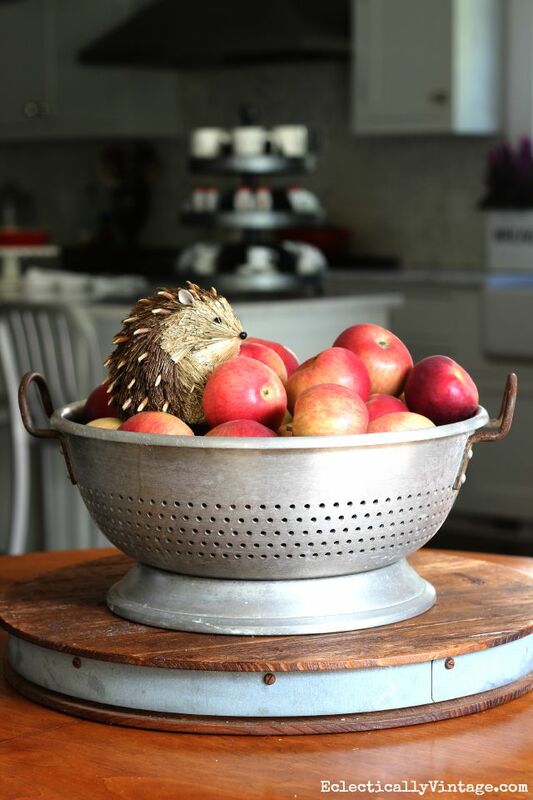 Before you start baking, display your favorite fall fruits on your table – add a cute critter for bonus points. Dry a batch of hydrangeas and enjoy them all year long (see my simple hydrangea drying method). Don’t forget your clipper on your next stroll in the woods for a simple but stunning arrangement. Is it decor? Is it a snack? Either way, a bowl of walnuts makes a great fall centerpiece especially when paired with vintage squirrel nutcracker (here’s a new version of my squirrel nutcracker). 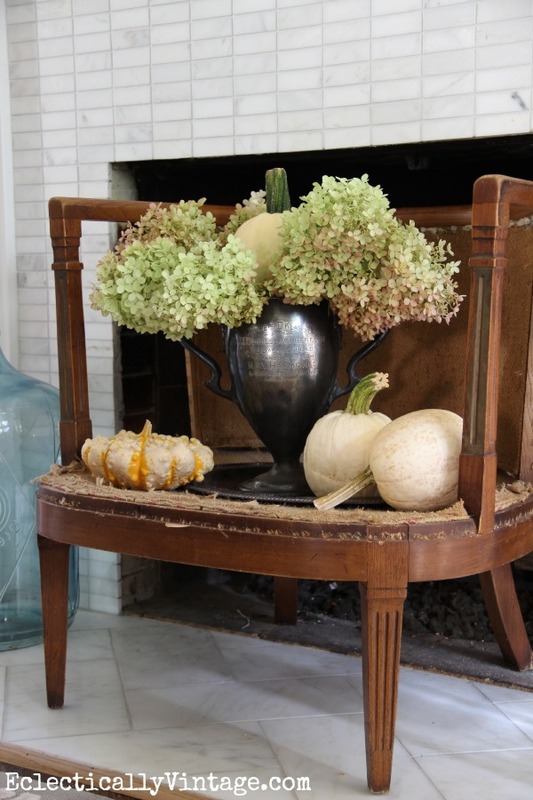 Add a few cotton boll branches to any vase for instant texture. 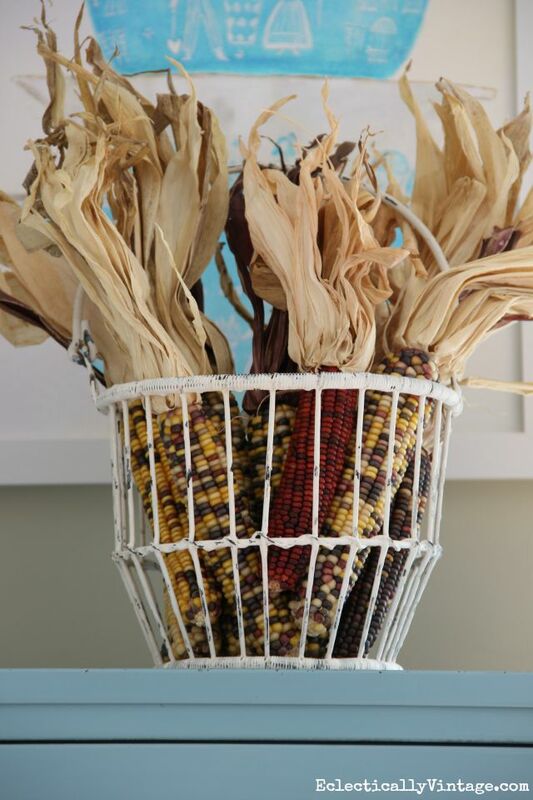 Gather a few ears of Indian corn and display in a bowl or basket. 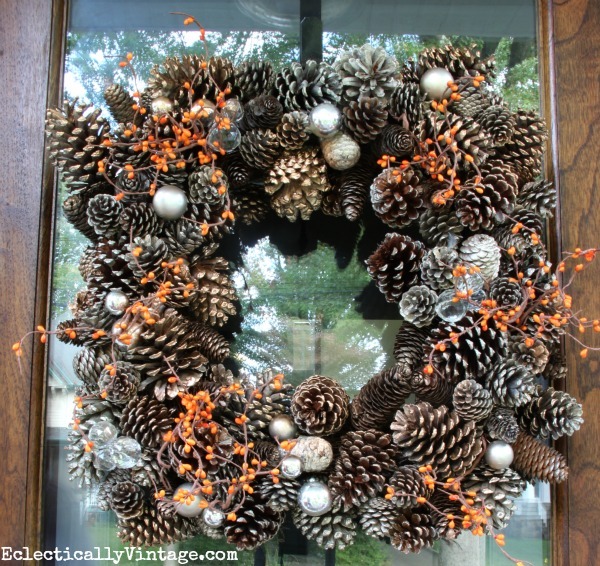 Make or buy a pinecone wreath or just fill a bowl with these fall favorites (add a few sprigs of colorful faux garland for color). 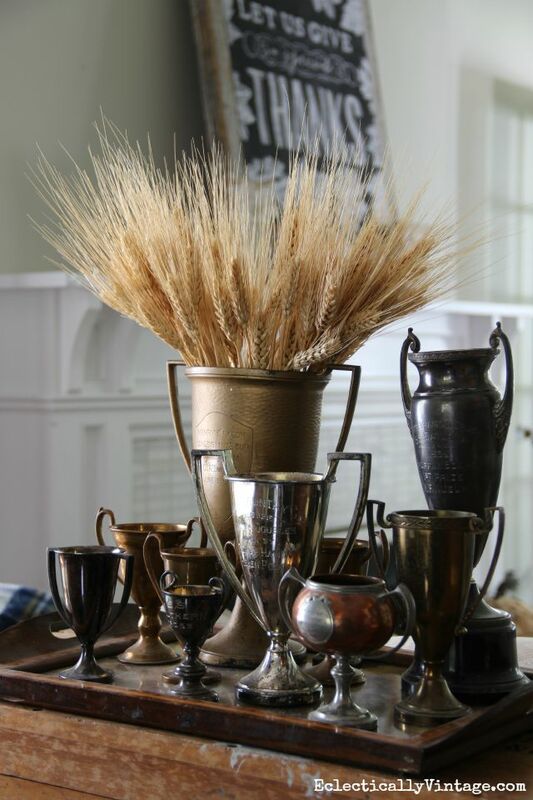 Cluster a bunch of wheat sheaves in a favorite vase or place individual pieces on table settings. Drag a fallen branch home, prop it against the wall, call it a day. I’ve got so many more fall decorating ideas so don’t miss my Eclectic Fall Home Tours. And if you love free stuff, you’ll love these 23 FREE Fall Printables. 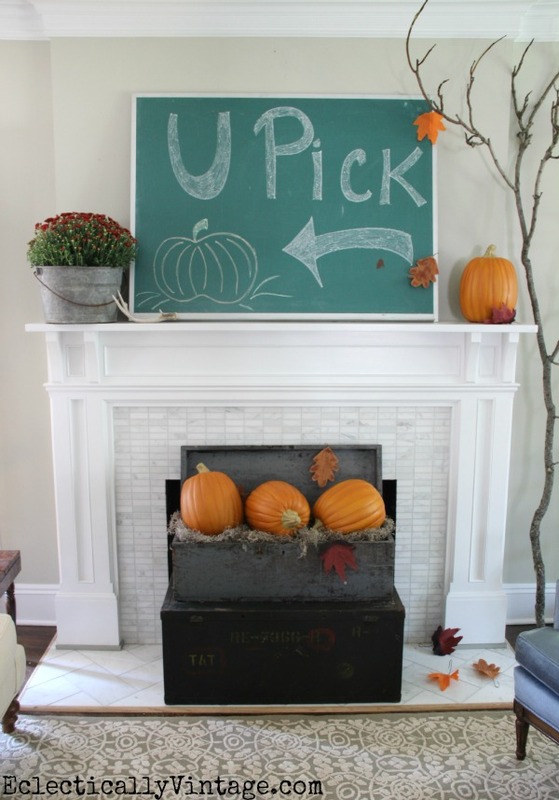 Some of my friends are sharing their favorite fall decorating ideas so make sure to check them out. Visit Emily A. Clark for more fall ideas to get you ready for sweater weather. i need this- i am hanging on to summer and feeling so fall uninspired! I love my flip flops … but wish I was wearing boots right now! Kelly, I love all of your fall touches! And, the fact that you have mums inside! (feverishly taking note now!) 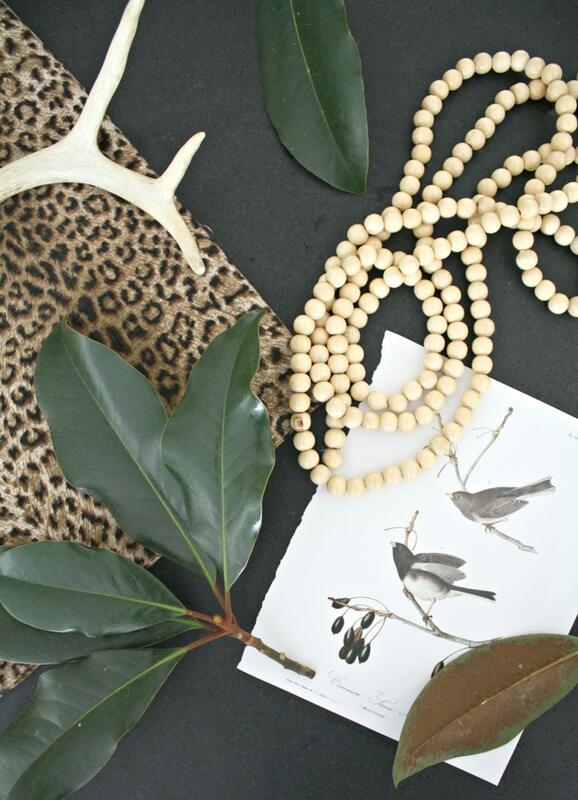 Such awesome ways to incorporate the outdoors in! Thanks Kelley (with an e)! Kelly I LOVE all the natural fall touches! 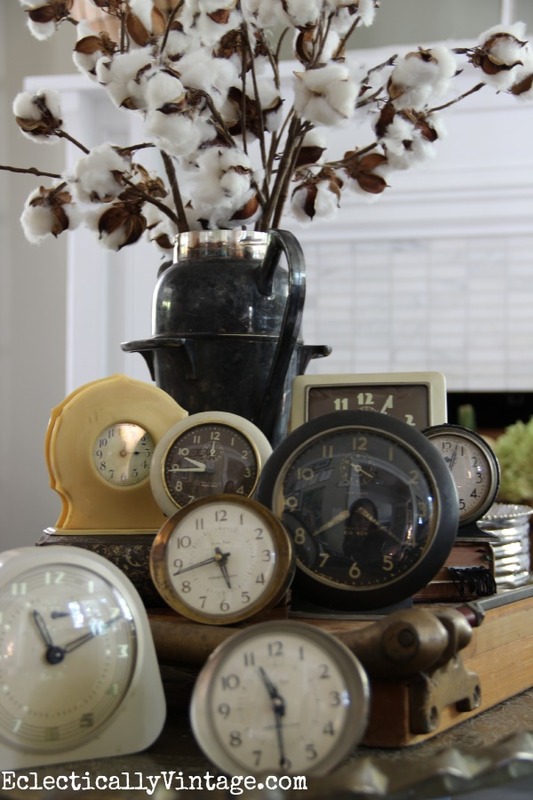 This is my favorite way to decorate as well. It was great seeing you a couple weeks ago! Thank you Sarah – fall is my favorite season! Great seeing you too – sorry I had to leave early Sunday morning and missed saying goodbye! Beautiful inspiration for fall, Kelly! 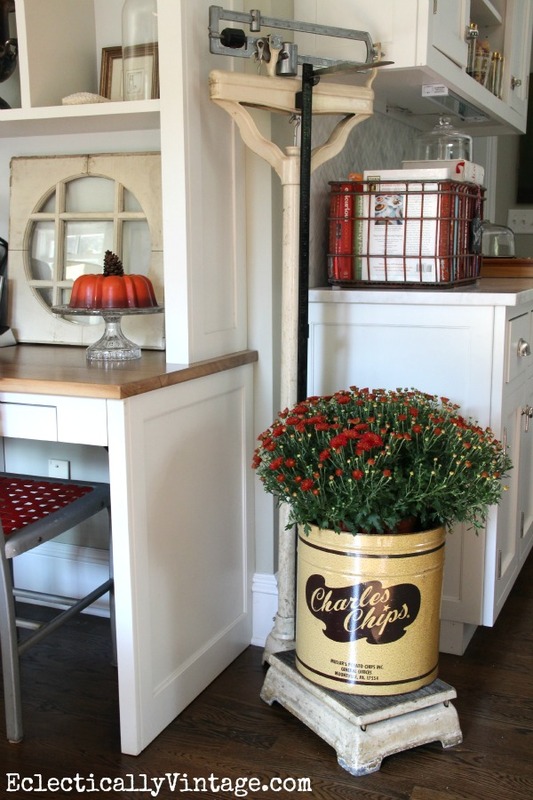 I love the Charles Chips tin vignette…be still my heart! Thanks Linda – I used to love when my neighbor got a Charles Chip delivery! Everything you posted here are very inspiring to me. 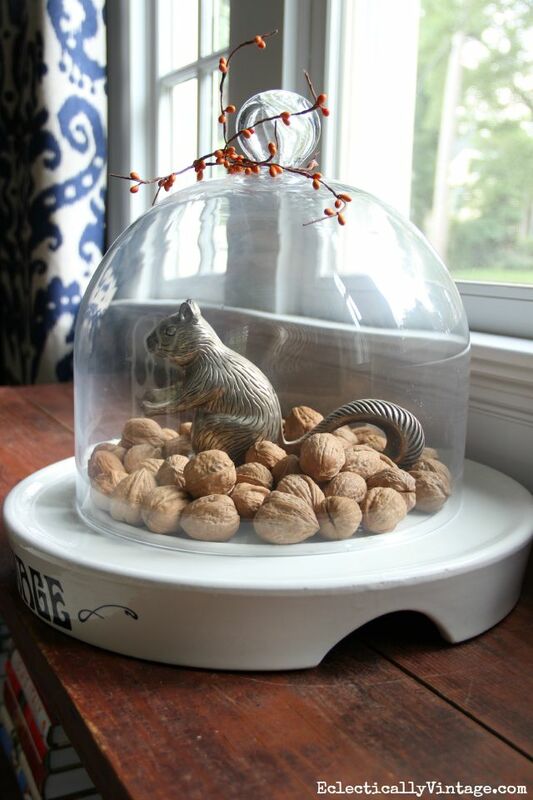 I especially love the squirrel and nuts under glass. You truly showed your beautiful creative talents, and we get to benefit. Thank you so much. Ahhh thank you so much Ivory – you made my day! Happy (almost) fall! 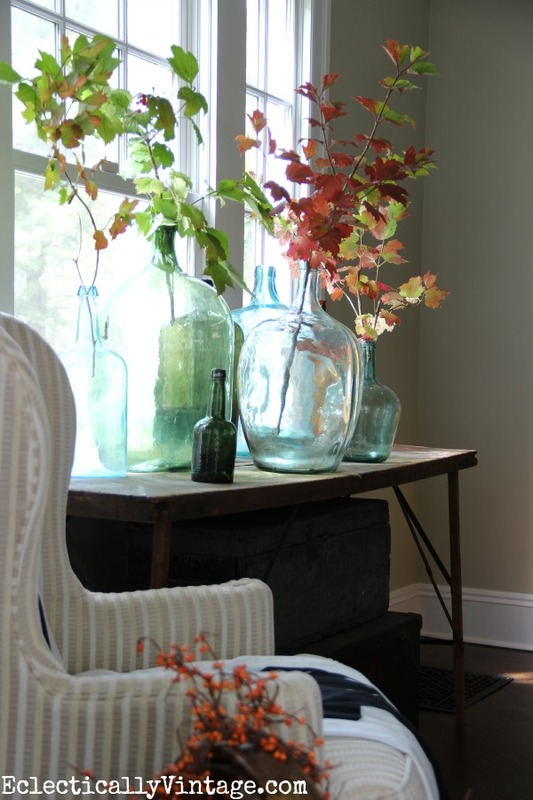 Those jars full of branches are stunning! 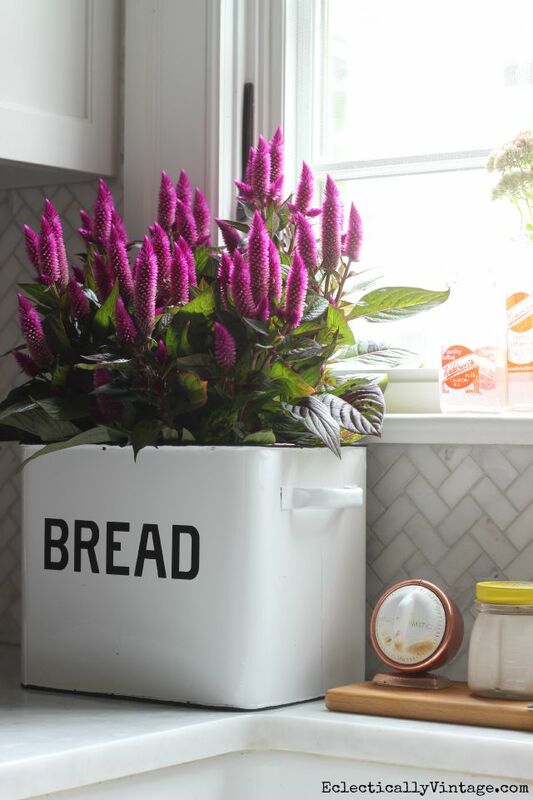 I adore your bread box filled with flowers too! So many pretty touches. Thanks Rene! 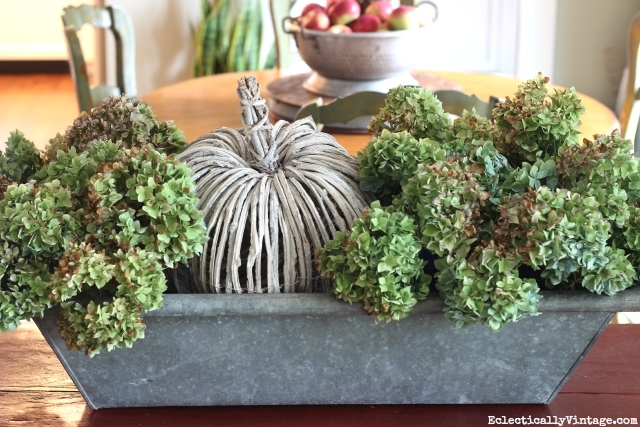 I love using unique containers – happy (almost) fall! Hi Kelly, such great inspiration here. I’m with you, I have had enough. This has been one hot and humid summer in NJ. I went down south this summer and it was so hot and humid but when I returned thinking I was going to get relief, it was just has hot and humid here! Kelly, fantastic tips! I loved the plants in unique containers and each example was just beautiful. Can’t wait to see what you are up to this year! Thanks Annie – I can’t wait to see what you come up with too! You always have the greatest seasonal decor Kelly! Thanks Shirley – coming from you, that’s such a compliment! I just got back from Ireland and it was 60’s and 70’s. Now it is 92 today. I love all you did for fall looks great and colorful just like fall. I love the little hedgehog in the apples! Love all your ideas! Thanks Lisa – I just pulled that little hedgehog out of hibernation and can’t wait to put him somewhere fun this year!